We’re food geeks. We eat weird food, we try weird recipes, and we geek-out over food. The geek makes dinners, pastries, cakes, and desserts. Super powers include creating extravagant meals, some really awesome pastries, and the ability to make a meal out of the few random things found in the fridge and pantry. His alter ego, Jef, is an IT professional who took a few years off of his IT career to be classically trained in cooking and pastry making. He can be found wandering the supermarkets aimlessly for something unusual, trolling the multitudes of farmer’s markets around San Diego looking for something fresh, or at a local gadget shop looking for the newest tech toys. You can email him at geek (at) myfoodgeek (dot) com. The eater eats. She will happily try anything the geek makes for her, and will usually love it. Her super powers include the bottomless pit. Her alter ego, Eliza, is a geek’s geek with loves of math, chess, and computers (and the geek!). She can usually be spotted playing with her smartphone even in the most exciting of places. You can email her at eater (at) myfoodgeek (dot) com. The apprentice is the geek’s trusty sidekick. He has a knack of coming up with some strange food combinations that don’t always work. He’s always willing to help out with anything in the kitchen, prep-to-cleanup, and, for the most part, isn’t a bad cook. His training isn’t quite complete but one day he will finish. He lives a world away from the geek but is a constant online companion. He’s hard to find, but usually has some new graphics, a new food comic, or cooking ideas for the geek. The dogs hang out in the kitchen, where the action is. They gleefully clean the floor of any crumbs and scraps that may fall there when cooking. They enjoy tasting the geek’s creations and begging whenever they can. They’re hopelessly attached to the eater. The cat is Simon. He’s the apprentice’s loyal pet. He purrs, runs, and makes strange noises at the birds he sees from his posh apartment. The dogs and the cat are sworn enemies. volume measurements are highly inaccurate. A cup of flour isn’t always a cup of flour. recipes listed by weight are easier to scale. I like my recipes in grams – it’s my blog, afterall. The geek will not make any promises, but there are numerous websites out there that will convert weight recipes to volume recipes. He cannot validate that the recipe will still work, but you are more than welcome to try and let him know. Recipes are tested by the geek and nothing is left out on purpose. There are no secrets in pastries and he is more than willing to answer questions if a recipe isn’t written clearly. 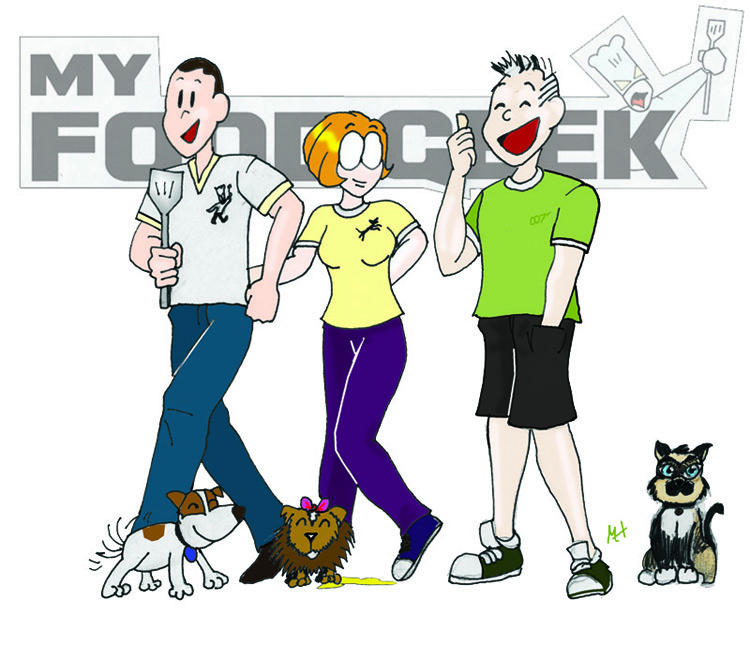 I really like your geeky food blog. I feel a special connection when I am reading your blog because I myself am also a geek (software developer) who loves to bake. I totally agree with your precise and use gram to weight to precisely measure out ingredients. This is extremely important to baking because it is more science than art.